Kolyo Marinov, 25 years old. Kolyo arrived at “House of Opportunity” Skravena in early December 2012 and left after 9 months. He was born in Byala Slatina. After his mother died when he was six years old, his father became a drunk and Kolyo was entrusted to residential care. He has five brothers but does not keep in contact with anyone from his family. He grew up in a home for children deprived of parental care, “Nikola Vaptsarov”, in the town of Roman where he finished secondary education. After leaving the institution, several years of instability and wandering followed. For a while he worked in construction, living wherever he could. But he knew he did not want to live like that. He had dreams. He wanted to move forward. He wanted to finish university. 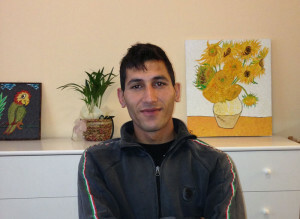 At the age of 22 Kolyo learned about the opportunity to stay at “Together” protected home in Gurmazovo from a friend. He stayed there for a year and with their support he started a driving licence course. He came to Skravena and stayed for 9 months. During this time he stabilized, completed his driving courses and successfully took exams. Now he is category B and C licensed driver. He prepared for and applied to the Sports Academy “Vasil Levski” and now he is a first-year student at the academy in the sports teacher profile. He wants to start a second major, Ministry of Interior, in the same university. His dream is to become a police officer. There were times when I was little, and when I was in the boarding house with my brothers we were stealing. Now I’m not interested. I do not want to. I feel like I ‘m cured of it. Now I better ask for what I want, or go to bed hungry than to steal. I want to become a cop. This will give me more chances.